While not a Horror aficionado I have been known to dip my toe in the area every now and again. One Horror author's work who I've found myself dipping into at regular intervals is Laird Barron. The man has won or been nominated for nearly every award he's been eligible, most notable winning the Shirley Jackson Award twice. His debut The Croning (released just last month) novel pretty much blew me away. It is a masterwork nailing the sense of dread combing folklore and Lovecraftian Cosmic Horror. 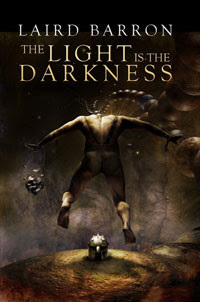 Around the same time The Croning was released I found out Barron was publishing a very limited (and expensive) edition of his long novella The Light is the Darkness and at over $200 it was out of my range. It is quite a beautiful edition that I found my mouse hovering over more than once. There's a couple photos of the lettered edition here. I held off knowing he'd probably include it in a future collection. I've just learned that there will be a trade paper release the middle of June for under $20 from Arcane Wisdom Press available through Miskatonic Books and other places like Barnes & Noble. The blurb is below, but it is Barron. Just go and order it already and if you haven't gotten his collections Occultation or The Imago Sequence or novel The Croning get thee to a bookstore. Conrad Navarro is a champion of the Pageant, a gruesome modern day gladiatorial exhibition held in secret arenas across the globe. Indentured by a cabal of ultra-rich patrons, his world is one of blood and mayhem, an existence where savagery reigns supreme while mercy leads to annihilation. Conrad’s sister has vanished while traveling in Mexico. Imogene, a decorated special agent for the FBI, was hot on the trail of a legendary scientist whose vile eugenics experiments landed him on an international most-wanted list. Imogene left behind a sequence of bizarre clues that indicate she uncovered evidence of a Byzantine occult conspiracy against civilization itself — a threat so vast and terrible, its ultimate fruition would herald an event more inimical to all terrestrial life than mere extinction. Now, Conrad is on the hunt, searching for his missing sister while malign forces seek to manipulate and destroy him by turns. It is an odyssey that will send this man of war from the lush jungles of South America, to the debauched court of an Aegean Prince, to the blasted moonscape of the American desert as he becomes inexorably enmeshed within a web of primordial evil that stretches back unto prehistory. All the while struggling to maintain a vestige of humanity; for Conrad has gazed into an abyss where the light is the darkness, and he has begun the metamorphosis into something more than human. Damn, my wife would kill me, but that's a gorgeous book.